Home / Blog / Parents share their hopes for Milwaukee Ave.
Parents share their hopes for Milwaukee Ave. The Chicago Department of Transportation (CDOT) is completing a major reconstruction of the highly-trafficked corridor between Belmont Avenue and Logan Boulevard. The goals for the project, according to CDOT, are to create public space, improve walkability, achieve Vision Zero by enhancing traffic safety and access to the area, and harmonize the various modes of transportation. This is a once-in-a-generation opportunity to reshape this popular corridor. From Logan Square to Belmont, two-thirds of the space is dedicated to cars. The percentage of residents who bike to work is higher here than the city as a whole. While more than half of residents drive to work, 25 percent of households did not own personal vehicles in 2015. Active Trans and others in attendance at this first public meeting noticed the participants were not fully representative of the diversity of the neighborhood. In response, Active Trans met with the Logan Square Neighborhood Association (LSNA) to see how we could better reach the diverse residents of Logan Square to make sure they were represented at the second public meeting. 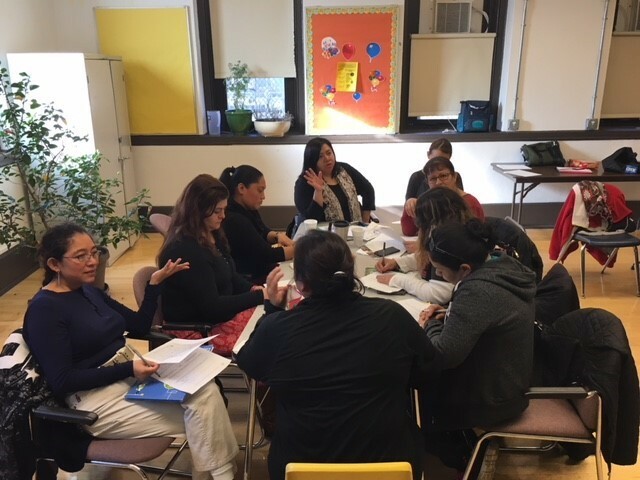 Last month, over the course of two Friday mornings, Active Trans staff attended parent mentor meetings at two elementary schools in Logan Square to mobilize residents to attend the second public meeting. Of the 28 parents we surveyed, 17 were in support of removing parking along the corridor to make more space for bus lanes, bike lanes or wider sidewalks. Rather than parking along the corridor, parents were interested in consolidating car parking into parking lots. Nearly all the parents surveyed access and use the corridor primarily by walking. There was a high level of concern about the family-friendliness of the corridor, given the many bars and restaurants that have been taking over the sidewalks, especially in warmer months, making it difficult for a family with a stroller or elderly person to navigate. There was near unanimous agreement that the Kimball, Milwaukee and Diversey intersection needs to be made safer for all roadway users. Almost all of the parents would like to see more green space at the Logan Square Monument and more street trees along the corridor. The second public meeting is scheduled for Tuesday, January 30th at Logandale Middle School, 5:30 p.m. – 8:00 p.m.
We hope to see plenty of residents attending the meeting and voicing their support for making Milwaukee Avenue safer for people walking, riding bikes and taking transit.